At the Scott McKellam Agency, our Northern Virginia social media marketing and management services are strategically designed to accomplish your specific objectives, so that you experience real world success, not just online status. In other words, we aim to get leads, not likes. You have many choices when it comes to Social Media Management Services for your business. We set ourselves apart because our social media campaigns not only connect online users to your brand, but our social media strategies are goal-driven. The result is meaningful engagement and interaction. As a full service SEO company for small businesses, we have a social media team that works with you to establish an effective business strategy. 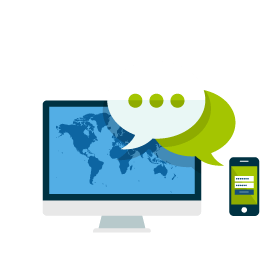 We define a target audience, create relevant content and engage them systematically. We make social media and effective extension of your brand. Branding and Reputation Management is more and more important every day. We help improve and track the reputation of your business and find out exactly how people perceive your brand. Whether Facebook, Instagram, Twitter or Snapchat, fresh quality content increases your traffic and brand recognition. Our cross-platform strategies project one strategic message for customer engagement. You must have a social media strategy. There is a lot of chatter out there. We help you put out relevant content that engages your audience. We create a content calendar and work with your to execute. When you use our Social Media Services, you are connecting a new audience to your brand in a way that meets them where they are. We control the message for you, and push to increase your brand awareness. We stay on the cutting edge of Social Media Marketing and encourage all our clients to generate content on the most popular social media platforms such as Facebook, Twitter, Pinterest, Instagram, Snapchat, Google+, and LinkedIn.